Gas, hybrid, plug-in, fully electric; that’s the standard progression a vehicle takes on its path to greener pastures. Take this Cayenne, for example. Introduced 15 years ago, Porsche added a hybrid variant in 2011 and upgraded its capabilities with a plug 4 years later. Over that time, I’ve tested every Cayenne model and this week it’s time to see what this plug-in, or E-Hybrid, has to offer in 2017. Commonly referred to as PHEVs – plug-ins are typical hybrids with batteries that can be charged by plugging them into a standard electrical outlet or high-voltage charging station. As long as you’re diligent about it, PHEVs can store enough electricity to greatly reduce the need for the gas engine, thus benefiting MPGs and greenhouse gas emissions. For instance, the gas-only Cayenne S with comparable output is rated at 20mpg in combined driving whereas this E-Hybrid checks-in at 46 miles per gallon equivalent on electric, 22mpg once the battery is depleted. There are currently only 4 of these plug-in hybrid SUVs on the market and they all travel about 12-14 miles on battery power alone. Compared with the Cayenne S Hybrid it replaces which returned 21mpg, this E-Hybrid features a higher energy lithium-ion battery and an electric motor that’s twice as powerful. The combined total power output of the supercharged 3.0-liter V6 and the electric motor is 416 horsepower and 435 pound-feet of torque resulting in a 0-to-60mph time of 5.4 seconds – faster than the PHEV from BMW, a little slower than those from Volvo and Mercedes-Benz. Top speed is 151mph but is limited to 78mph on electric. At 240 volts, such as at a public charging station, it takes 3 hours to juice up. Spending an extra $840 on the optional hi-output onboard charger is a no-brainer as it cuts charging times in half. It is not compatible with fast chargers, however. You can also recharge the battery while driving in e-Charge mode which uses the engine as a generator. Though I didn’t have access to it, the Porsche Car Connect app allows owners to check the Cayenne’s charge status and pre-condition the cabin among other things. The on-board navigation system though doesn’t include charge stations among its POIs, but with Apple CarPlay on board, you can use your phone’s Maps function instead. Though small by today’s standards, this touchscreen also provides hybrid-specific information and a trip meter with various measurements. Overall, it’s straightforward and easy to use. Much of this same information can be displayed in one of these pods, controlled by a steering wheel thumbwheel – an ergonomically sound setup. With Porsche sports car engineered into its DNA, the Cayenne is an SUV for the driver with a tuned chassis, robust power and an enthralling experience. It handles a road unlike any other. Of course, there’s a price to be paid for this. The least expensive model starts at over $60,000 while this E-Hybrid costs no less than $80,000, far exceeding the price tags of its competitors. Mileage for PHEVs varies widely depending on usage, but for what it’s worth my weekly average of truly mixed driving has been about 30mpg. Porsche’s options lists are famous, or infamous depending on how you look at it but this particular build borders on crazy. There’s no smart key entry or push button start, no side blind zone alert, not even a backup cam…I can’t even remember the last time I drove a car without one. With an as-tested price inching in on $90,000, this stuff and more just needs to be standard equipment. The Cayenne is on the precipice of a complete redesign and this generation is starting to feel a little dusty and at times, sparse even. Are those halogen fog lights? From a utility standpoint, the slide, recline and splitfold rear seats are generously spacious, even for 3. They are heated and include 2 USB ports. The expandable cargo area also feels amply sized though the seats don’t have remote release levers nor do they fold anywhere near flat. Clever storage areas, grocery bag hooks and hands-free access are absent. Also, this model has a hybrid-specific permanent all-wheel drive system that doesn’t possess the off-road chops of some other Cayennes despite its 8.5” of ground clearance. As much as if not more than any other SUV, the Cayenne feels like a tank from behind the wheel. It has the stoutness of an armored vehicle that owners will love. As long as you’re fully charged, the first 14 miles or so will be all electric, as long as you’re not going really fast or switch over to Sport mode. Now this is where the supercharged engine joins in and reminds you that this is indeed a Porsche. As with nearly all hybrids, the powertrain’s fluidity can feel disjointed at times…this isn’t the smoothest thing in the world… and as in my last Cayenne Hybrid test, the brakes continue to be the weakest link with some grabiness and an unnatural feel. The 8-speed automatic also feels confused at times. But I like that you can feel the road without it being brittle, however even in the Comfort mode some might find it too firm. The steering is quick and sports-car like. The seats with their Alcantara inserts are nirvana and in general, I quite like the quiet electric motoring provides combined with this Cayenne’s on-demand Porsche-level driving execution. The only exception to this is the excessive tire noise created by the upsized 21” max performance summer-use rubber. This one here, the Platinum Edition, carries an as-tested price of $88,240 with only a handful of options. A federal income tax credit of over $5,300 is also available. This Mahogany Metallic paint really grew on me but the E-Hybrid’s acid green accents with this color I’m not so sure about. And with the charge port located out back combined with a smallish rearview mirror, I’ve never missed having a backup cam more. 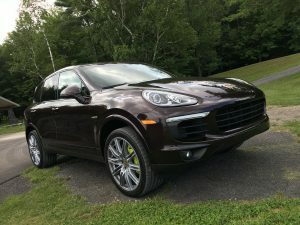 With an all-new Cayenne knocking on the door, you might want to pump the brakes on this one but from an exclusivity and environmental perspective, the E-Hybrid has allure.